Elliston pulls apart the IPCC’s iconic diagram (AR4, page 115) to reveal fundamental errors (shown below). 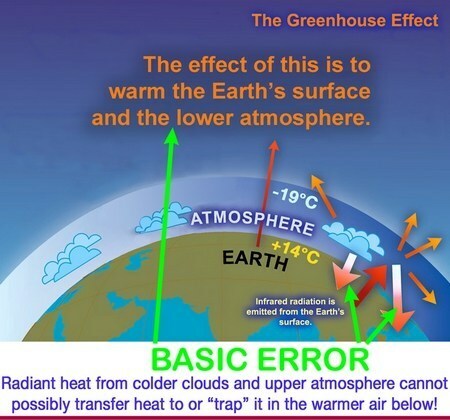 The cartoon-like diagram is simplified to illustrate the flaws in their “Greenhouse Effect” concept. The definition and the accompanying diagrams below are the centerpiece of global warming science: the UN IPCC Assessment Report (2007) and are a major cause for concern. Even friends of the IPCC are now conceding that the very choice of “Greenhouse Effect” to imply that water vapor and trace levels of CO2, methane, etc. cause global warming is unfortunate. Even 53 of the “best” authorities have a haphazard history of saying our atmosphere is, then it isn’t like a greenhouse. In reality our open atmosphere cannot act like a glasshouse because there is no physical barrier to confine convective recirculation of air. Within the enclosed space of a glasshouse, air is warmed by surfaces and objects heated by solar radiation through the glass and it must circulate within it. In the open atmosphere warm air simply rises to higher altitudes and expands until it is as cool as its surroundings. Indeed, as this extensive study shows, sunspot activity in the magnetic gaseous plasma at the surface of the Sun is related to the “tide-like” gravitational influence of Jupiter. Sunspot activity increases the heat content of solar radiation because sunspot temperatures are about 4,000 to 4,500°K. This is still brighter than an electric arc on Earth but the heat content of the spectrum is increased. Total radiant heat gained by the Earth must establish and maintain equilibrium with total radiant heat lost. 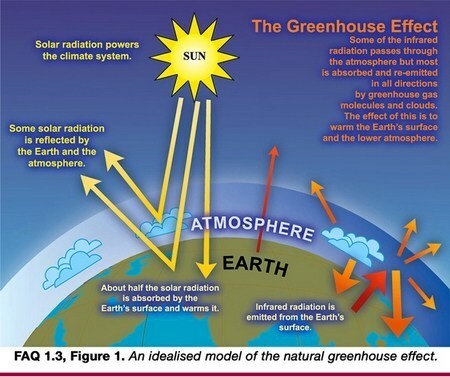 As IPCC claim, solar radiation powers the Earth’s climate system. It is the only source of sufficient heat for cyclic climate changes. 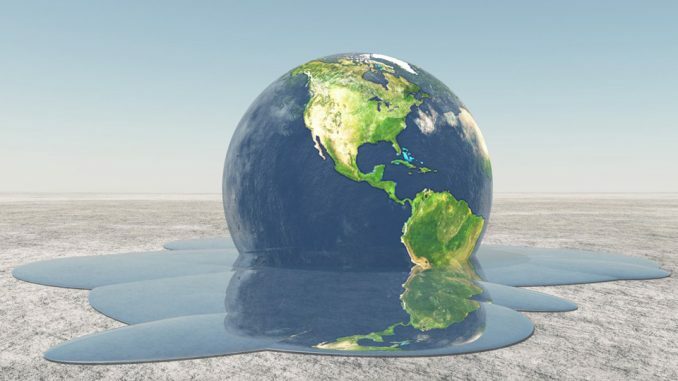 As in the past, global climate change can only be due to longer or shorter-term variations in solar radiation. Elliston is a stickler for adherence to the traditional scientific method and has been dismayed at how government climate science appears to have abandoned the principles of fidelity to empirical evidence. In recent years John has served as Principia Scientific International’s Vice Chairman. His latest book, ‘The Origin of Rocks and Mineral Deposits – using current physical chemistry of small particle systems,’ has ground-breaking research enhanced thanks to John’s access to the world’s leading academic advisers. In fact, Elliston found that nowhere in the IPCC is there established any causal link between increasing levels of CO2 in the atmosphere and the global weather records that indicate an increase in average global temperatures. However, strong fluctuation but no increase in average global temperature due to the continued increase of CO2 levels has been recorded for the last 15 years. Also, there are now no fewer than 85 peer reviewed papers discrediting the core claim of a CO2-driven radiative greenhouse gas effect (GHE). Yet, our planet’s average global temperature COOLED by more than half a degree Celsius from February 2016 to February 2018, according to recent NASA data. Thus, wiping out all the so-called ‘man-made global warming’ of the 20th century. Thus, the IPCC has relied greatly on jargon and computer models instead of good old fashioned analysis based on observations and assessment. In doing so, climatologists have confused each other with explanations of scientific detail that disregard or misuse Planck’s law, Wein’s displacement law or the Stefan-Boltzman law.